The recipes in this little book have been sent by Belgian refugees from all parts of the United Kingdom, and it is through the kindness of these correspondents that I have been able to compile it. 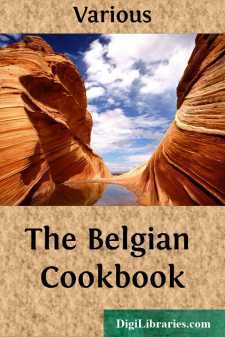 It is thought, also, that British cooking may benefit by the study of Belgian dishes. The perfect cook, like Mrs. 'Arris or the fourth dimension, is often heard of, but never actually found, so this small manual is offered for the use of the work-a-day and inexperienced mistress and maid. It is not written in the interests of millionaires. The recipes are simple, and most inexpensive, rather for persons of moderate means than for those who can follow the famous directions for a certain savory: "Take a leg of mutton," etc. A shelf of provisions should be valued, like love-making, not only for itself but for what it may become. SAVORIES: If you serve these, let them be, like an ankle, small and neat and alluring. This dish is not obligatory; recollect that it is but a culinary work of supererogation. SOUP: Let your soup be extremely hot; do not let it be like the Laodiceans. You know what St. John said about them, and you would be sorry to think of your soup sharing the fate which he describes with such saintly verve. Be sure that your soup has a good foundation, and avoid the Italian method of making consommé, which is to put a pot of water on to warm and to drive a cow past the door. FISH: It is a truism to say that fish should be absolutely fresh, yet only too many cooks think, during the week-end, that fish is like the manna of the Hebrews, which was imbued with Sabbatarian principles that kept it fresh from Saturday to Monday. I implore of you to think differently about fish. It is a most nourishing and strengthening food —other qualities it has, too, if one must believe the anecdote of the Sultan Saladin and the two anchorites. MEAT: If your meat must be cooked in water, let it not boil but merely simmer; let the pot just whisper agreeably of a good dish to come. Do you know what an English tourist said, looking into a Moorish cooking-pot? "What have you got there? Mutton and rice?" "For the moment, Sidi, it is mutton and rice," said the Moorish cook; "but in two hours, inshallah, when the garlic has kissed the pot, it will be the most delicious comforter from Mecca to Casa Blanca." Simmer and season, then, your meats, and let the onion (if not garlic) just kiss the pot, even if you allow no further intimacy between them. Use bay-leaves, spices, herbs of all sorts, vinegar, cloves; and never forget pepper and salt.